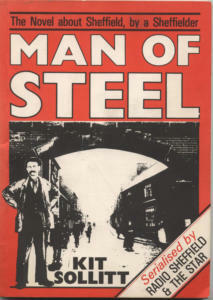 Kit Sollitt, a former steel worker in Sheffield during the Second World War, wrote Man of Steel in the late 1970s based partly on her experiences during that time. Man of Steel takes place over 30 years between 1915 and 1945 as it chronicles the life of Michael, a young man who grows up to become a steel worker in one of the large firms, marries, and then suffers personal tragedy. Kit herself worked in industry. At 14 she began work as a French polisher, but it was when the war broke out that she was one of the first women to answer the call to keep the foundries working. She worked for Moore and Wright assembling rachets for micrometers, and then Hardy Patent Pick as a sandmiller. The novel is well paced, with plenty of Sheffield talk and references to landmarks to keep a local reader grounded. The first two chapters, which chronicle Michael’s lost siblings and father, mean that the novel is a little slow to get going, and some of the cat-calling of the female foundry workers could be considered old fashioned for readers today. 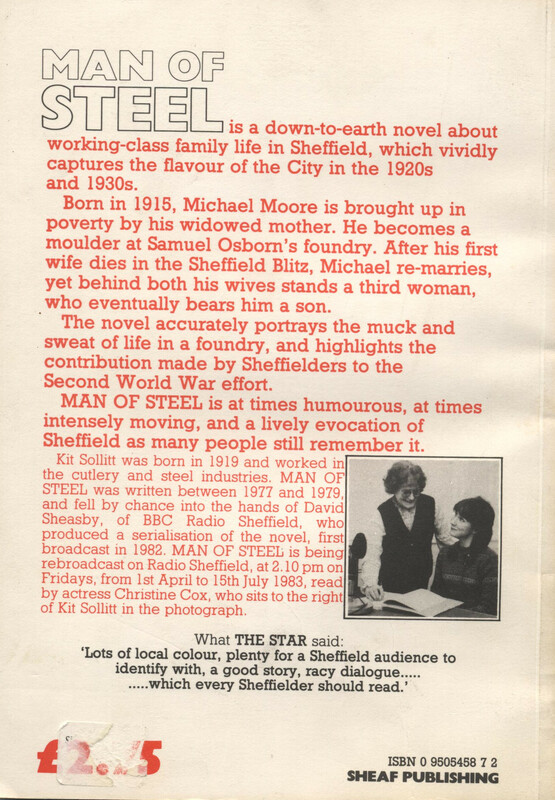 When it was published in 1982, Man of Steel had already been picked up by both The Star and BBC Radio Sheffield, who serialised it. Kit went onto be a part of the successful Women of Steel campaign, and attended the unveiling of the statue outside the City Hall. Perhaps it is time to revisit this novel again, as we start to lose the remaining surviving members of that generation of men and women.